It’s slow cooker season! Typically I use my slow cooker for soup and meat, but this year I’m going to diversify and use it for new types of meals! I’ll start with making desserts in my slow cooker and after browsing through all the irresistible slow cooker dessert recipes online, I can’t wait! You can use it to make cakes, puddings, cookie bars, crisps and cobblers. My sweet tooth is screaming for me to try some new recipes. The trouble will be deciding on which one to make first! Which dessert will you make first in your slow cooker? Yum! Love having this list to refer to. Love making dessert during the holidays but it isn’t always easy with busy schedules. Crock pot will get more use this season! Thanks for sharing my carrot cake! Brownies, puddings, and cakes, oh my!! How am I supposed to resist trying some of these??? Dessert in the Slow Cooker!!! I am definitely going to be checking these all out and giving them a try! I never thought about using my slow cooker for desserts. I love being able to throw something in the slow cooker and forget about it till needed! I love using my crockpot and this looks like a really yummy list! I have never even thought of making a dessert in the slow cooker, thanks for the ideas! I’ve never thought about doing dessert in a slow cooker. Definitely going to try! I never imagined making dessert in a slow cooker, excellent! 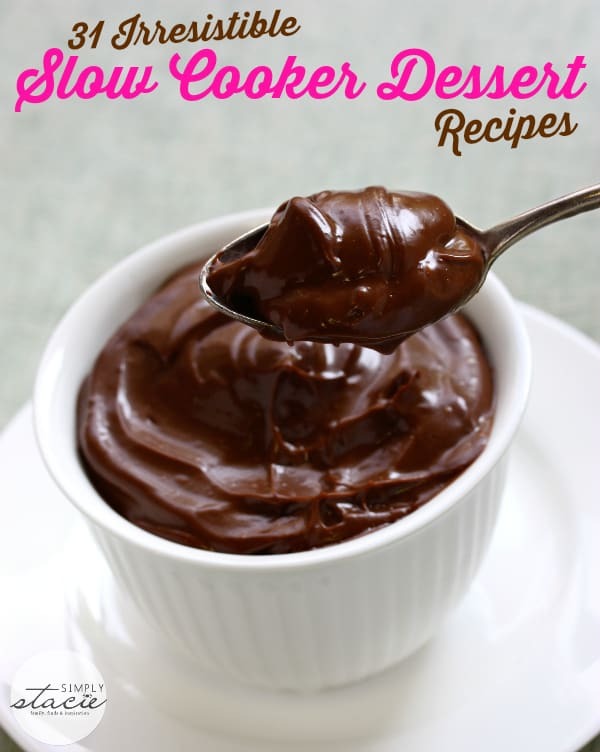 I love using my slow cooker for meals, but I have never tried it for desserts. I must try out some of these recipes since my family likes dessert. All these recipes sound so delicious! There are a number of them that I would love to try. Crockpot Bread Pudding with Salted Caramel Sauce looks really good. I have made almost everything in the slowcooker but never a dessert. I might give it a go! And to think that I once thought only savory things could be made in a slow cooker! Oh my yum, Slow Cooker Overnight Pumpkin French Toast Casserole??? I need to buy a slow cooker now! I would never have even thought to make desserts in my slow cooker 🙂 Thank you . I love Slow Cooker Creme Brulee the most. Thanks for sharing. Great collection! Now I’m hungry…. lol! Thanks for all of these delicious recipe ideas! I really want to try the Slow Cooker Chocolate Chip Cookie Bars and see how it turns out! Oh my! These sound wonderful. You know, I have never made a dessert in the slow cooker, but I HAVE to try some of these!!! These recipes all look amazing but I think I will start with the Triple Chocolate-Peanut Butter Pudding Cake!!!!! Wow! It’s got to be delicious and so easy to make too.Thank you for sharing this awesome list.I am a big food lover and will enjoy them. Oh my! These sound so delicious! Some of these I can’t wait to make…they sound amazing. Thank you for sharing. A slow cooker is still on my wish list! I would love to try the Crockpot Bread Pudding with Salted Caramel Sauce! I didn’t know you could make dessert in a slow cooker. I think I’ll start with the Slow Cooker Hot Fudge Pudding Cake or the Crockpot Chocolate Lava Cake. Thank you for sharing this wonderful recipe post. What a super list of desserts to prepare with the slow cooker. I want to try Slow Cooker Blueberry Coconut Cobbler really soon! I cannot wait to try a few of these recipes. Always great to have more slow cooker recipes, especially desserts. Thank you! These recipes look delicious! I love that they are for the slow cooker because ours gets a lot of use in the Fall/Winter seasons. There are some really good Slow cooker recipes that I would love to try. Slow cooker cookie bars & Cheesecake…Where do I begin? I cook almost anything I can in a slow cooker, so this is awesome. Which recipe is the one featured in the picture? oh wow, what a list! I don’t usually think of my slow cooker for desserts but will have to try a recipe or two now. The bread pudding with salted caramel sauce looks amazing! I must admit that I never thought I would use my slow cooker for making dessert. You have listed numerous desserts that can be made and I plan to spend more time looking through them to see which one I should make first.